Collecting Elvis Presley's original Sun recordings is truly collecting pieces of history, and real history can be expensive. Not surprisingly, then, Presley's first released recording, 'That's All Right'' (Sun 209), for the independent Sun label in Memphis, continues to be a chip investment for anyone who has a spare $3206-$4007 for a Near Mint 45rpm copy. But although ''That's All Right'' will always be the Holy Grail of early Elvis artefacts, because of its historic position, it's not the most rare of his five Sun singles. His third release, ''Milkcow Blues Boogie'' (Sun 215), is definitely the scarcest, though it's hard to see where Elvis was heading with his rockabilly version of Kokomo Arnold's slow bottleneck blues from the 1940s. Starting with an out-of-tempo recitative passage before stepping into gear, Presley's cut of this musical tale about a disappearing source of income could nowadays clear your bank account to the tune of around $3206 - $4810. As he gained popularity, the slightly more musically compact and commercial – and, therefore, better seller at the time - ''Mystery Train'' (Sun 223) remains Elvis' easiest Sun release to acquire, still hovering between $2000 for a very clean copy. Bearing in mind that all price suggestions are flexible until a sale has been made, and that actual sales can vary wildly, the projection for Presley's other two singles on Sun, ''Good Rockin' Tonight'' (Sun 210) and ''Baby Let's Play House'' (Sun 217), is about $1603 - $2404 apiece, and for that money you would also be buying records with a certain amount of surface noise, which is inherent in early Sun 45s that were pressed by Plastic Products Inc. in Memphis, Tennessee. This pressing plant, like many others at the time, reputedly used ''anything'' suitable that might have been available for the composite of records. Defective pressings, which Sun returned to the plant as being un-saleable, were recycled into new product. When you see yellow flecks buried in the playing surface of a Sun record, they are actually particles of the labels from recycled records. Everything went back in the pot! 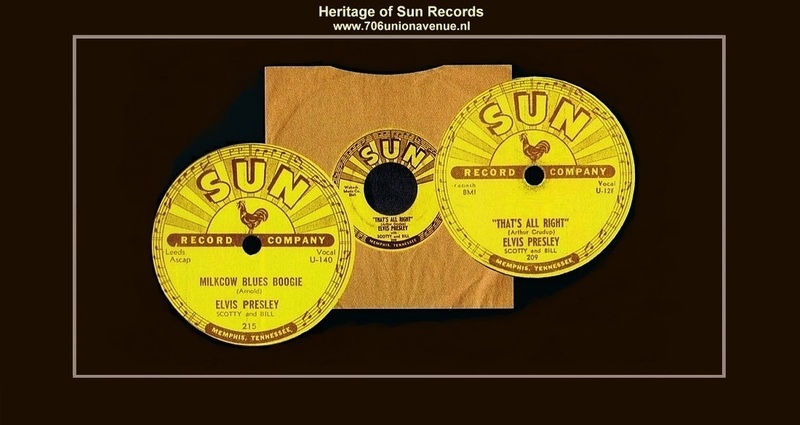 Identifying authentic Sun records from fakes is a problem everyone has to get to grips with if intending to spend four figures for one record; and it's not so easy, as some spurious pressings look very authentic at first inspection. You can't always tell by the thickness of the vinyl. Original Memphis 45rpm pressings of Elvis' ''That's All Right'', for example, will have the matrix number, U-128-45 72, tightly etched by hand on the dead wax area of the record. ''72'' does not mean it was pressed in 1972, as some people think, it's the number given to that particular copper pressing-plate. Generalising about Sun records, those pressed on the west coast usually have a triangle or ''delta'' sign incorporated with the matrix number, which would not be present on a Memphis pressing. Real copies of ''That's All Right'', should also have three easy-to-see round impressions marks on the label area. All of Elvis' Sun records came in plain brown paper sleeves; company sleeves with the sunray design were printed much later. None of his records were issued with picture sleeves, and there were no EPs or LPs produced while Presley was under contract to Sun. While everyone determined and rich enough would try to collect the full set of Elvis' original Sun 45s, before they become virtually unaffordable museum pieces – who plays them, scarcer option: the same titles pressed at 78rpm speed. Everyone knows how breakable these 10'' treasures are and, naturally, their survival rate seems to be lower than the less destructible 45. The present scarcity of some 78s is a situation that was not helped by Sun, either. 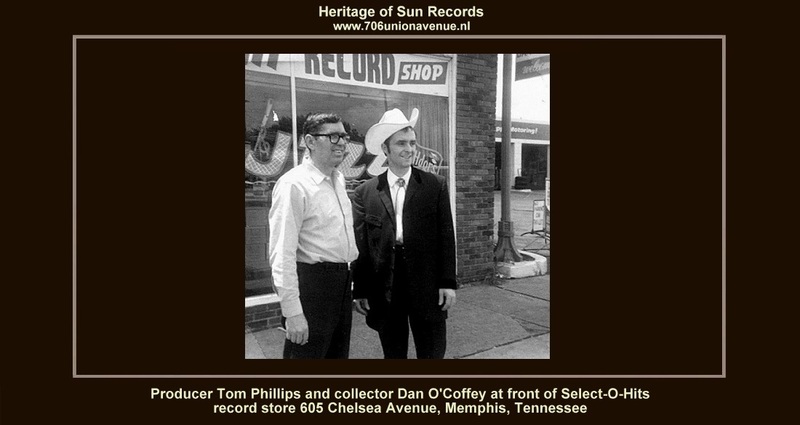 Tom Phillips, brother of Sun's owner Sam Phillips, ran the record shop with a distribution warehouse at the back, next to the studio at 706 Union Avenue. This later moved, as Select-O-Hits Inc., to 605 Chelsea Avenue in Memphis. Whenever there was a county fair, Tom would sell off cartons of 78s to the event organisers, who used them as targets at a kind of coconut shy. The records were individually hung on string and customers would throw hard balls to break as many as they could. A kewpie doll or teddy bear doesn't seem much of a prize compared to the records that got destroyed to win one, but relatively few people at the time would have thought that rockabilly and blues records held the promise of much future value. There's another story, too, which is bizarre enough to be true. At the Sun warehouse, as well as having records stacked on racks and others packed in hundreds of cartons, there were many high piles of flatstacked 78s on the floor. One day Tom allowed a rockabilly collector by the name of Dan O'Coffey from England, into the warehouse to buy some old records at 25 cents each. The visitor, shocked by the sea of records in front of him, promptly went into something resembling straight for the piles of 78s. Crashing into them, with one stack after the other cascading down, he managed to decimate a huge quantity of ultimate collectors' items in just a few minutes. With incidents like this, natural breakage, and the wholesale dumping of 78s when 45s finally took over, it’s easy to see how brittle Elvis 78s have dwindled during the past 50-plus years. In November 1955, Sam Phillips received $35,000 from RCA Victor in exchange for his singer and all of the master recordings he had cut at Sun (Elvis got $5000). ''Mystery Train'' (47-6357 released November 28, 1955), the last release on Sun, became Elvis Presley's first release on RCA. This was followed by ''That's All Right'' (47-6380 released December 19, 1955), ''Good Rockin' Tonight'' (47-6381 released December 19, 1955), ''Milkcow Blues Boogie'' (47-6382 released December 19, 1955) and ''Baby Let's Play House'' (47-6383 released December 19, 1955), before the new recording, ''Heartbreak Hotel'' (47-6420 released January 27, 1956), made its international entry in 1956. All of the Sun reissues, and indeed other singles released by RCA that were made at Sun, such as ''Just Because'' b/w ''Tryin' To Get Of You'' (47-6639 released August 31, 1956) , can fetch between $100-$160. Near Mint copies are getting scarcer by the year, however, so any in top condition can command a premium.